Looking for a last minute gift idea? How about a fantastic book that features the people from your neighborhood and some problem solving! Tinyville Town Gets to Work! by Brian Biggs features all the towns people from Tinyville - including the Mayor, trash collectors, and Engineers. When a traffic jam comes up the town works together to build a new bridge and solve the problem. This is an adorable book! We have really enjoyed it. I was also sent two additional books in this series. These two are board books unlike the first title. 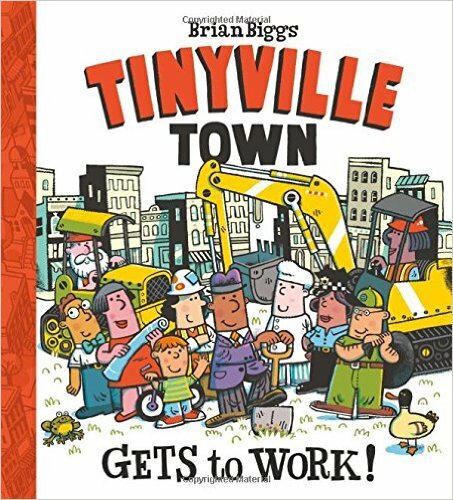 Tinyville Town I'm a Veterinarian gives kids a real glance at what vets do each day it is a super cute book. Tinyville Town I'm a Firefighter takes us through a day of firefighting including where they sleep and what happens when a fire breaks out. This book is done in a sweet way that gives the information but is not scary at all. The firefighters help out the baker in town and all ends well. I love how these books give plenty of information with out being overwhelming for little ones.